So, this one should look familiar with last night's Democratic Debate being held there. 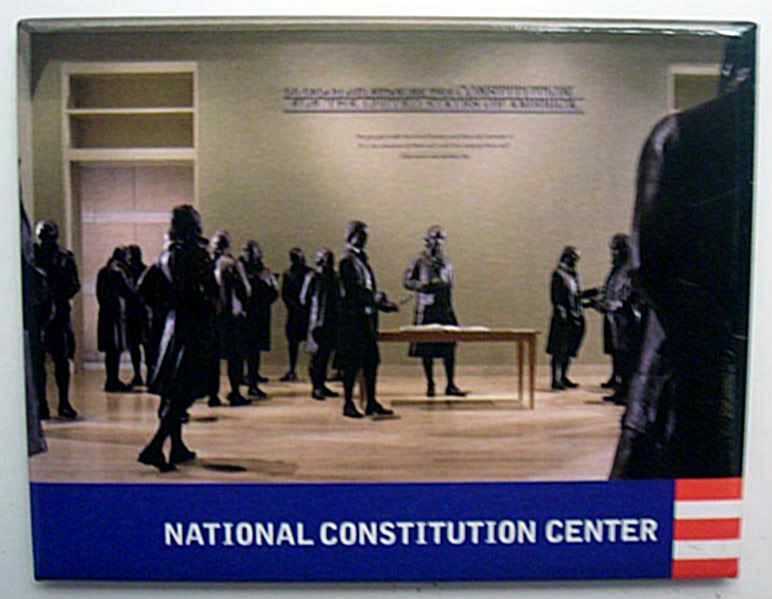 It's the National Constitution Center, in the heart of Philly. Ok, so you'll see that I pretty much say this about every museum, but this one was just such a museum experience. And by that, I mean it's an experience, you're not just looking at old stuff in glass cases and skimming a little placard. This one's just fantastic. I spent only a couple of hours there (indeed, it was the penultimate stop before the Federal Reserve Bank, but after the Independence Hall Tour and seeing the Liberty Bell, all in one day), but it's truly one of those places that you have to spend a lot of time, just soaking it all in. There's several parts and pieces of the center, there's the experience part, where you're taking in the interactive exhibits, then there's rotating exhibits, and then a multimedia presentation...the typical inspirational piece designed to bring tears to your eyes. Yeah, it worked. The image here is of Signers Hall - where they have life-sized bronze statues of the signers. And you can walk through the hall, and compare how tall you are, you can take pictures with your favorite signer (what?) and actually read what's on the table. Loved it. Every bit of it. As much as I believe that every American should visit Washington, D.C., I believe every American should visit Philadelphia as well. For that's one of the best ways to begin to understand the legacy that our Founding Fathers left us. DUDES. I mentioned visiting the Fed Reserve. Nu-uh. It was the U.S. Mint. Good grief.